The Meta-Leadership framework and practice method has been developed after extensive research on and observation of leaders in high-stress, high-stakes situations. It provides individuals with tools that are conceptually and practically rigorous so that they are better equipped to act and direct others when leadership effectiveness can mean the difference between success and failure. 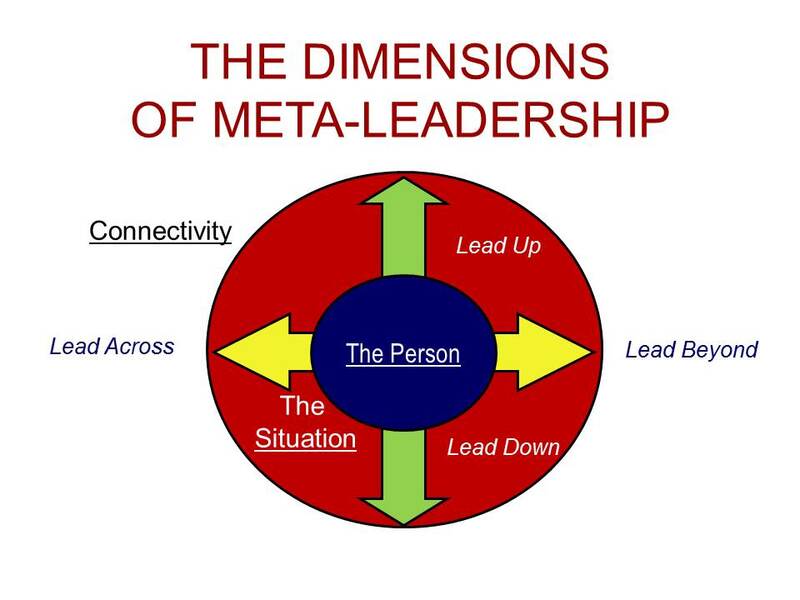 Meta-leadership is currently being used by leaders in the public, private, and non-profit sectors around the world. Meta-Leadership is a guide to solving complex problems involving numerous stakeholders. The “Meta” prefix describes an overarching grasp of problems as well as a broad perspective on potential solutions. Organizations are now less hierarchical and more oriented toward inter-dependence with other entities: an enterprise view of what they do. Therefore, successful leaders must expand their thinking and activity beyond formal bounds of authority. The definition and metric of Meta-Leadership is “people follow you.” Those people include a boss, peers, outsiders as well as subordinates. THE PERSON OF THE META-LEADER: Meta-Leaders are grounded in who they are and why they are leading. Their authenticity rallies those who follow. Exhibiting emotional intelligence –self-awareness, self-regulation and motivation, their authenticity rallies those who follow. In stressful times, they are able to get up and out of the “basement,” the primal survival fear instincts of their brain that otherwise overcome rational decisions and actions. They foster this discipline and balance in themselves and others. THE SITUATION: Step one in solving a problem is in understanding it. What is happening? The “Meta” view encourages a far-reaching analytic lens, recognizing the different experiences and motives of the many involved stakeholders. Building solutions requires development of options, engagement of key parties and negotiation of mutually acceptable and feasible solutions. CONNECTIVITY: Meta-Leaders intentionally link and leverage the efforts of many different organizations and people. By strategically galvanizing knowledge, motivations, and capabilities, they forge invaluable unity of effort and initiative. This connectivity includes leading DOWN to subordinates; leading UP to bosses or reporting authorities; leading ACROSS within one’s organization; and leading BEYOND to those outside the organization. The result is a collaboration that coalesces key stakeholders who are together able to accomplish outcomes that none could reach alone.